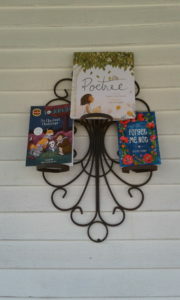 While the ending is a bit cliched, over all Poetree is a fun way to introduce poetry to that “middle aged” young reader. The poetry is mixed into the story, therefore, making this not only a poetry book, but one with a story. Which is, friendship comes in unusual places. s more in special ways to share with the tree. However, one day, there is no poem from the tree and she is worried that something is wrong. Yet, nothing is wrong, it is just that she learns the real author of the amazing poems and makes a special friend in the process. There is a side story that happens in school that shows the reader who that certain poet might be due to a not so subtle clue. While this book can be a fun read-aloud, the reader who is about 7 or 8 could start reading without a lot of help but could go slightly higher if the picture book format does not turn them off. The art of Shahrzad Sliney is simply darling. They are fresh, perfect pops of color, yet muted. They are spring-like and happy. There are details not necessarily important to the story directly but are a nice addition. The slightly abstractness of the art is a delight to view. While you can see the squirrel is a squirrel, they are not as sophisticated as they could be. Which helps them accent the text perfectly.